Perculia over at Wowhead News has put out a few really good articles highlighting some great transmogging (or mogging as I think I'll call it) items. The first article entitled "Transmogrifying Armor: Getting Tier Sets" highlights how to acquire tier armor sets. The second article entitled "Transmogrification, Part 2: Unique Items and More Tier" goes over even more items with unique looks. For this post I'm going to be focusing on the second article. 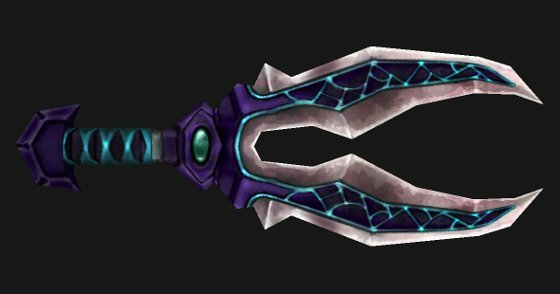 I'll be going through Perculia's post and highlighting some of the daggers I find interesting (and somewhat easy to obtain). Read on after the jump for screenshots and links. First off I consider "easy to obtain" items to be items that can reasonably be obtained by one level 85 or any class solo (or in some cases duo). I won't generally be highlighting items that require more than two level 85s to obtain (such as 10 or 25 man raid items etc). I will include items that are part of the normal level 85 dungeons/heroics rotation as these could be farmed solo via the Looking For Dungeon tool. While I know many of our readers will have no problem obtaining the items in older raids I'm mostly a solo player and so gravitate to items I can farm on my own or with my wife. I generally don't want to get a raid together and have people spending time for just a chance that something may drop. Again you may have that luxury and if so I encourage you to read the full Wowhead new article for the full list. 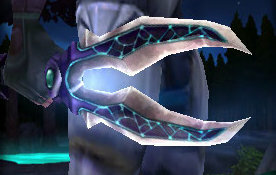 Looks: This is a dual-blade dagger with a curved profile, a faint white glow and purple and aqua green detailing which looks like cracked stone. 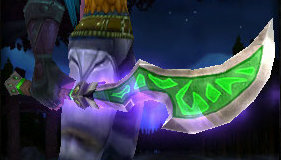 Obtained: Dropped by Pandemonius in Mana Tombs Heroic. Looks: A straight blade dagger with a sharply angular point. Red and gold detailing reminiscent of Blood Elfs and the Sunwell. Strong green glow. Obtained: Dropped bym Reinforced Fel Iron Chest in Hellfire Rapmarts Heroic. Matching Items: If you're looking for a matching dagger consider getting a few friends together to kill High Astromancer Solarian in The Eye who drops the Heartrazor. Looks: A broken bottle plain and simple. (Perfect for those times when someone insults your woman and needs to be dealt with right now.) As they are not unique yes you can dual wield broken bottles. Obtained: Dropped by Plugger Spazzring in Blackrock Depths. Looks: I large dagger that sheaths on the players back instead of the waist. 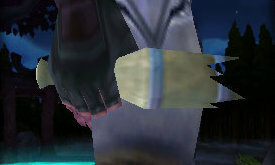 Highly stylized curved blade with a hook notch near the hilt. 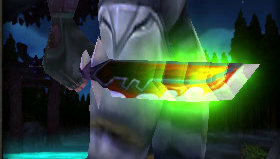 Bright green rune pattern on a dark green background on the blade. Obtained: Dropped by Jin'do the Godbreaker in Zul'Gurub Heroic. I hope you've enjoyed these few highlights of daggers that you could use in your transmogrification efforts. I look forward to doing more of these type of themed posts.